Hello and welcome back for the launch of Water School 2017! Following an exciting and fruitful 2016, Dar Si Hmad's Water School is back in full swing for our second year. This year, the Water School will provide environmental education lessons for schoolchildren in a new part of the Ait Baamrane region. We have moved from Tinin Amlou to Tangarfa, and our beneficiaries are now totaled at 86; with 59 from one school and 27 from another. Working bimonthly, our Water School will span seven sessions, from February 16th until May 4th. Themes will cover the water cycle, animal and plant biology, community garden, health, recycling, conservation, ecosystems, and more! While we are keeping to last year's innovative and detailed curriculum, new changes and updates have been made to ensure that Water School 2017 is the most beneficial it can be. This year our fantastic Water School teacher, Fatiha, has the goal to "give kids tools on how to be friends with their environment and to understand it very well, and to make them aware of climate change". In order to accomplish our goals for 2017, staff, volunteers, and of course, Fatiha, have been busy working to set up new games, activities and materials for the students. Fatiha is hoping for an even better year than last! While she holds many moments and memories dear,"the most emotional one was when they named a tree with my name - 'Fatiha'." And the School doesn't just help the students: it's a launch for many community projects and provides training for urban youth passionate about education. Last year, our Environmental Youth Ambassadors enjoyed their time immensely. Abdelhaq Ait Boulhous, former EYA and now part of our staff, suggests "all the new EYAs to go to Water School. Concerning Fatiha, she is like their sister; she interacts with the students deeply and with feeling. She is so incredible with her interactions with small children. Children want to know everything, and she is sharing all her knowledge with them. She is a great point of contact between Dar Si Hmad and these kids." Salma Edrif and Mahdi Lafram found themselves likewise inspired by Water School and its curriculum. 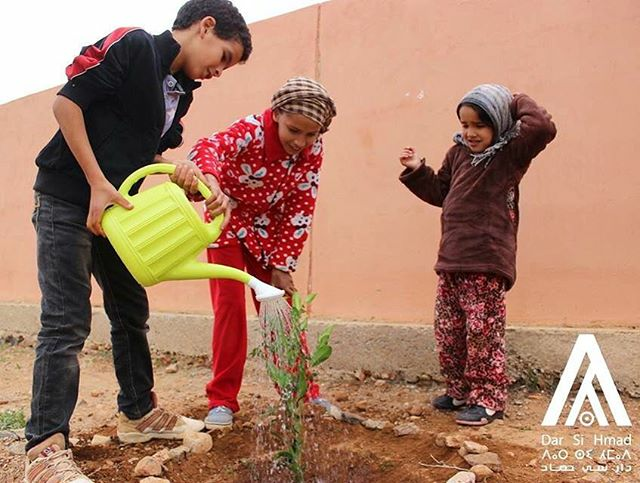 Salma remarked upon the fact that while many Water School beneficiaries have never seen Agadir, or even the sea, they were able to tell "stories about the water cycle, molecule movement and deep understanding of what causes the water scarcity their villages suffer from. They showed me with pride around their small garden in the school yard, competing with each other to give me maximum accurate information about a tree’s life cycle and span, and their dreams to turn their community into a major national supplier of vegetables and fruits they will plant in their shared farm, once they are a bit older." Mahdi, who created short films about our sessions, believes that "the program was enriching and I loved every part of it - Water School was the best: from pedagogy and curricula to the energy of the children and the passion of the staff members." Dar Si Hmad's partnership with local villages has led to very successful environmental education and engagement in the Ait Baamrane region. Our Water School is part of Dar Si Hmad's commitment to accessible environmental education for each and every child. In the wise words of Salma, "when the core of society receives such ecologically aware and sustainability driven mindset training from an early age, it becomes part of their own personal culture, their families, then their communities, through transmission." We hope you will join us and check back to see our Water Heroes in action!